You know, a good dessert doesn't have to be complicated, time-consuming, and "everything's made from scratch" to be fun, unique, and have that "wow" factor. I love my mini trifle dishes. I got them at the Crate and Barrel outlet last year. I have 12 of them. And, I love creating fun, easy, unique desserts in them. 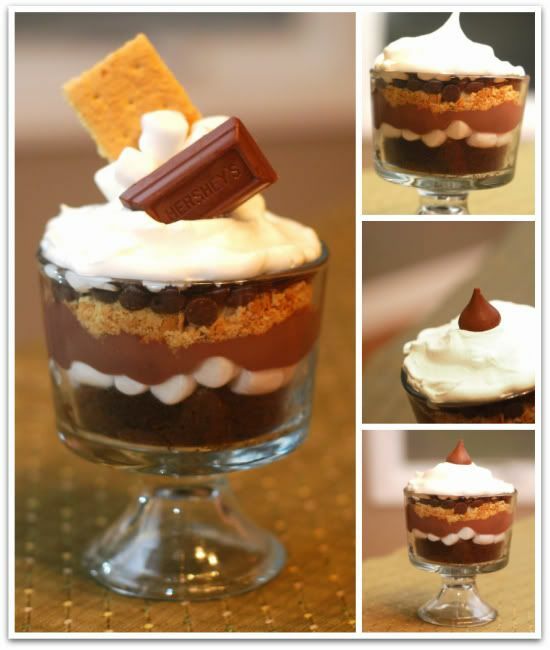 This weekend, I created little S'more trifles out of the simplest of ingredients. I have named them "S'mifles". I love how each of the layers really stand out against the others. 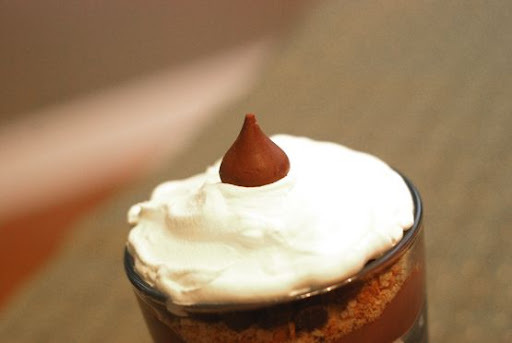 Valentine's Day trifle? Ooh la looooove. I love Hershey's kisses. Nothin' says love the way they do. But, I'm gonna have to say that I liked the top of this one the best. Half of a graham cracker, some mini-marshmallows, and a mini-Hershey's chocolate bar. I love playing with my food. 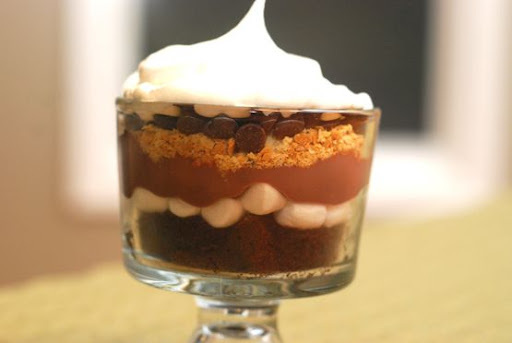 Of course, you don't need individual trifle dishes to make this yummy dessert. 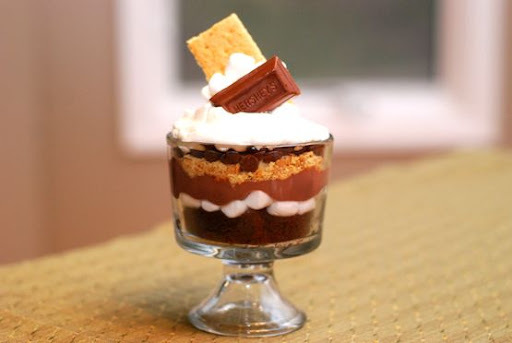 Make one big S'more trifle in a large trifle dish. Layer on up in a glass mixing bowl. Use a small juice glass. Use a drinking glass. Double the fun. Just make 'em. With whatever you've got. They taste even better than they look. Happy food. I love happy food. Prepare chocolate cake mix and pudding according to package directions. Cut cake into 1-inch squares. Set aside. Layer in the following order: chocolate cake, marshmallows, pudding, crushed graham crackers, chocolate chips, whipped cream. Top as desired. Oh, girl... I was on my way to bed and now I am drooling. I love your happy food. It matches your happy heart. 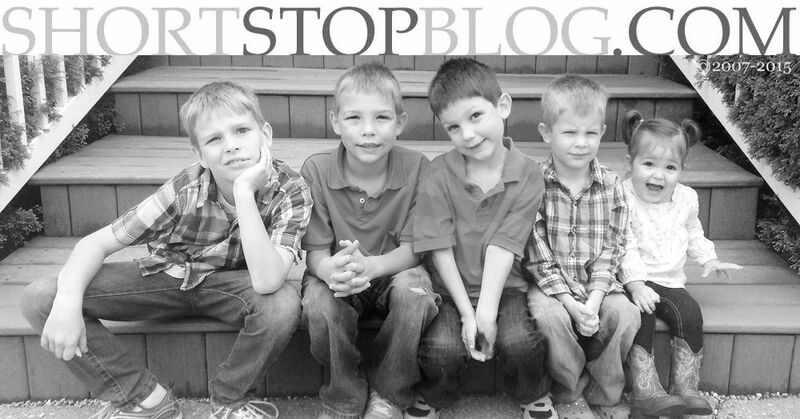 And I LOVE this idea... you are amazing, Sar. Those are adorable and so are the mini trifle bowls! Microwave it (sans Cool Whip)! Mmmm...those look so delicious yet so simple. I love the dishes too. i you were a Friends fan I'd make some crack about a traditional English trifle and "it tastes like feet". but your trifles, I'm sure, didn't taste like feet. Oh. Me want. Me want one now. Looks so pretty! My mom does the same thing except for brownies instead of chocolate cake. 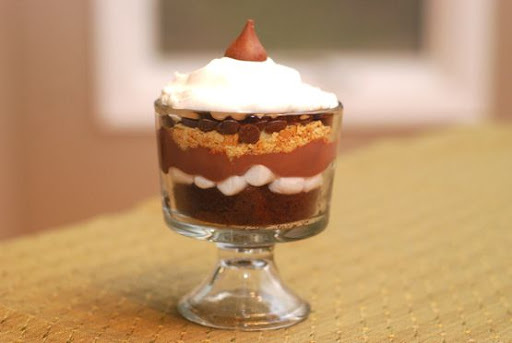 I want to get me some mini trifle dishes! Those are adorable and what a fun shout out to summer... bet it would be fun in the middle of winter when you're thinking about summer and campfires! Um, yum. That's all I can say lest the drool make its way down my chin. Yum. Oh and TOTALLY laughing at Jessica B's comment. We love that episode! I love it! 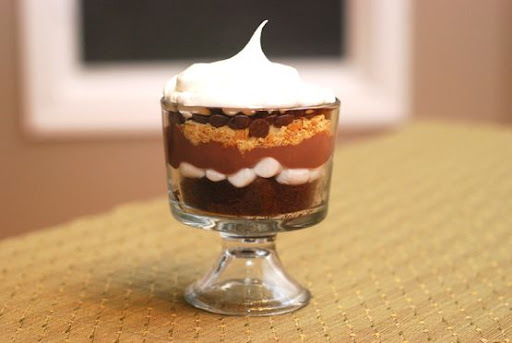 I just bought mini trifle dishes and was looking for fun ideas. I LOVE S'mores! omg that was so yummy i made it for my friends and they loved it thanks!! !